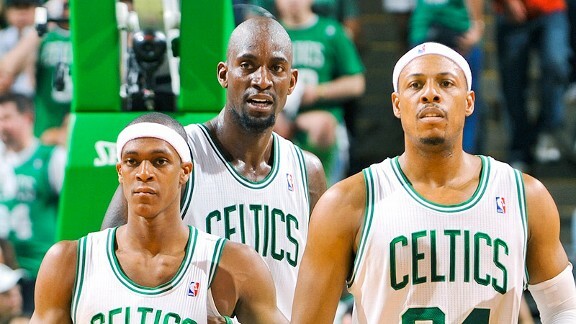 Are the Celts Better Than 2008? Although it is impossible to predict the NBA season already, I think it is safe to say that the team that Danny Ainge and Doc Rivers assembled this summer could be the best one that we have seen in at least 4 years, maybe even longer. Sure, we lost the best shooter the game has ever seen and KG and Pierce are that much older, but we brought in the perfect kind of players to fit into our system. Pierce averaged roughly the same PPG last season (19.4) as the year we won it in 2008 (19.6). Garnett’s numbers are significantly different and he is not feared by every player breaking through the lane anymore, but he is still a leader on this veteran team. In 2008, Leon Powe and James Posey were arguably our best bench players, both averaging about 7.5 PPG. I am willing to bet that Jeff Green, Jason Terry and Courtney Lee will all average above 10, or close to it. And with their amount of energy, experience, and Lee’s outstanding defense, they will be one of the most feared guard groups in the league, especially once Bradley is back. There is one other major difference between the then-and-now teams, and that is Rajon Rondo. He averaged 10.6 PPG, 5.1 APG, and 4.2 RPG in the 07-08 Season. Last year, he averaged 11.9 PPG, 11.7 APG, and 4.8 RPG. He has also developed into one of the best point guards in the league and a leader on a team that is mostly older than he. Although we have clearly re-fueled our roster, other teams have also gotten better. The Heat are obviously the team to beat, the Lakers had a huge summer trading for Howard and picking up Nash, and the Thunder are one year more experienced. The Spurs are always good and our division just got tougher with the new Brooklyn Nets. For anyone who thinks the Knicks are finally going to be good are mistaken. It should be an interesting season, as long as we can stay healthy for a change. This entry was posted in Celtics and tagged boston, boston sports blog, bryant, celtics, celts, heat, Howard, Kobe Bryant, lakers, Lebron, nba, pierce, Thunder by christoph131. Bookmark the permalink. You shouldn’t sleep on the 76ers. It can be a difficult season for us to retain the Atlantic Division. I agree I should have written my predictions. They lost the poor man’s lebron (Andre Iguodala) but picked up a huge force in the middle with Bynum, although they are most certainly paying for it (over 16 million). I think the standings will go Celtics, then Nets, Then 76ers, then Knicks, then that team from canada..